Last week was Questionmark’s 10th annual Users Conference – and the eighth one that I’ve personally been able to attend. At each of the previous conferences I’ve attended, I’ve been asked the same question: Why are you doing paper evaluations when you’re an online assessment company? We actually had a very good reason: our main interest in doing session evaluations was to maximize the quality and quantity of the feedback that we received. If you wanted to maximize response rates, you had to make it as EASY as possible to answer the survey. For smile sheets, paper trumped online… until now. Smartphones equipped with cameras are commonplace – many of us couldn’t imagine leaving home without ours. QR Codes embedding website URLs are easy to come by, too: at grocery/department stores and malls, on billboards, in magazines, brochures, you name it. QR Code- reading software, which essentially turns your Smartphone into a hand-held scanner, is freely available. Questionmark’s auto-sensing, auto-sizing assessment delivery engine enables a single assessment to be delivered reliably and effectively on many different browsers and platforms – PC or mobile – without any extra steps for the author or administrator. Plus, you can capture key demographic information to the assessment results from an assessment URL. 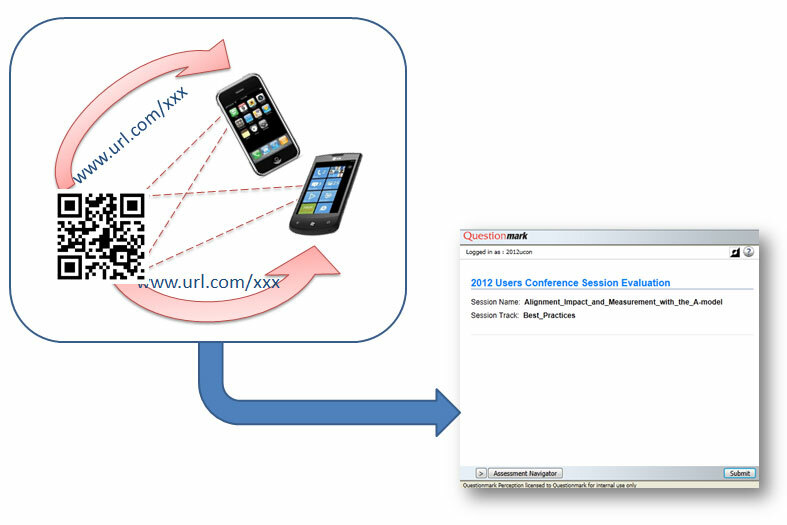 Delegates at the 2012 Users Conference had two choices for providing session evaluation feedback: scan a QR code with their mobile and answer the survey online, or fill out a paper form (which would be scanned and uploaded via Questionmark Printing and Scanning following the event). 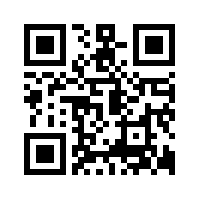 For those using mobiles, scanning the QR code would launch the assessment. The intro screen would display the name of the session they had just attended (just to be sure they scanned the right code). 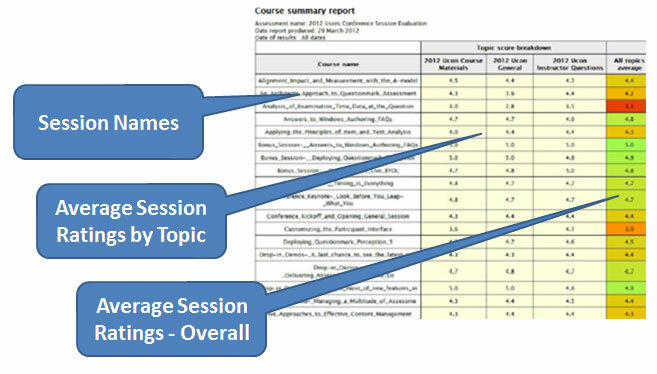 While I was happy that the mobile smile sheet delivery would ease the burden of post-conference scanning and uploading of results, it was particularly useful to get a real-time view on how delegates were reacting to sessions – during the conference we ran our Course Summary report (see below) a few times a day to get a sense of which sessions were bringing the most benefit to our customers. 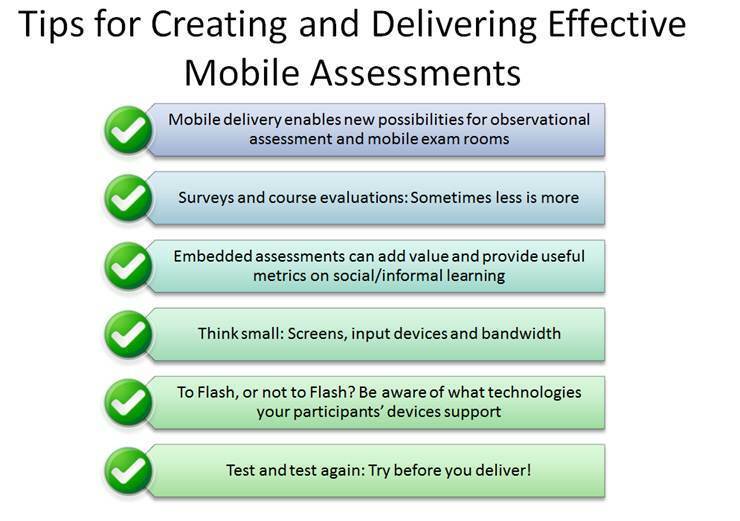 This was the first year we offered this option, and I was pleased to see to that more than 20% of all the session evals submitted were done via mobile device! Next year we’ll shoot for 80% and for 100% in 2014! Paper-free and loving it! QR codes for surveys: A perfect fit? Let’s face it…QR codes are everywhere. They are in magazines, stores and even food boxes. So now you might be asking how this fits into surveys. Let me back up a bit and explain. The hardest part of using surveys or course evaluations is getting people to complete them. For years, people have been trying to find out how to make others want to fill out surveys. I personally avoid surveys at all cost (ironic I know). Some universities have gone as far as not giving a student credit for a class without filling out a course evaluation survey. But I am not sure that is the best way to collect valid information. At the other extreme, some have just stopped trying to collect the information. I am not sure that is right either. It’s important to give people a vehicle for sharing their thoughts or feelings – and also to heed what they are telling you. So how do we make people want to fill out surveys? I think QR codes could prove to be an effective technique for drawing people in and encouraging them to participate. We know that many people don’t fill out paper forms (which need to be rescanned anyway) and a lot of them also avoid links. But people are drawn into QR codes. The mystery of what is behind the code is enough for most people to draw out their phone and give it a scan. So how might this apply to learning? QR codes could be put onto a class syllabus, a poster board at a conference or on a webpage (yes you can scan a QR code on your computer). By asking the right questions, you can later filter results by the demographic data you collect on your surveys. So how about giving this idea a whirl? 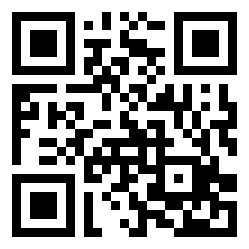 Try out my QR code survey below and then try and see if QR codes increase traffic on your surveys.